The Obama administration has recently updated the official U.S. social cost of carbon (SCC), which attempts to estimate the costs of damage from carbon pollution. It’s one important way to show the value of cutting our global warming emissions. 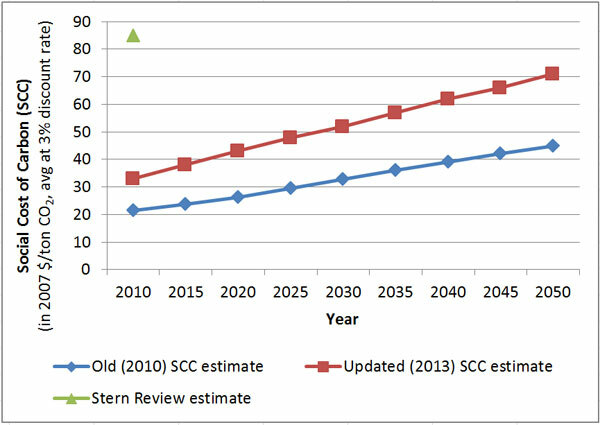 We’ll need to keep improving the SCC estimate to ensure it reflects the latest science and economics. We also have to ensure a more transparent process for updating and using this critical number going forward. But today’s House hearing on the SCC is simply a sideshow aimed at undermining climate action, not likely to focus on issues of substance. These SCC calculations are important for evaluating the costs of activities that cause heat-trapping emissions, and therefore important for evaluating the benefits of any policies that would reduce the amount of those emissions going into the atmosphere. Currently, they are included in the cost-benefit analyses that accompany many federal rulemakings to help evaluate the benefits of reductions in CO2 emissions from agency rules. For example, the recently-issued microwave efficiency standards included a calculation of these benefits that amounted to $58.4 million per year (in 2011 dollars) for 38.1 million metric tons of CO2 reductions from 2016-2045, using a 3 percent discount rate and a value of $41.1/ton of CO2 for the SCC. Cost-benefit analysis has been a staple of agency rulemakings (conducted as part of the regulatory impact analysis) since President Reagan was in office, and often championed by conservatives. They are an important economic tool to help make decisions on pollution standards, although they require putting a monetary value on every item included. Of course, a cost-benefit analysis shouldn’t always be the sole criteria for making regulatory decisions – for example, in the case of toxic pollutants, setting a health-based standard would be the ideal approach. The Clean Air Act allows for this distinction. Without an SCC estimate, by default we would be using a value of zero, implying that carbon pollution has no costs. That is patently not the case, as pointed out by numerous studies that outline the health and economic impacts of climate change. It’s also important to recognize that recent regulations that have included carbon reduction benefits in their benefit-cost calculations show benefits exceeding costs by a wide margin whether or not carbon benefits are included. For example, the microwave efficiency standards had benefits that outweighed costs by a factor of 3 to 1, without including any benefits from CO2 reductions (See table 1.2.1 here). 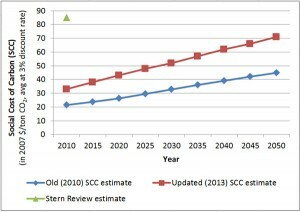 In February 2010, the administration released its previous estimate of the social cost of carbon. The new SCC estimates are higher (see chart below). In 2020, the old estimate was $26.3/ton CO2 and the new estimate is $43/ton CO2 (both in 2007 dollars, at a 3 percent discount rate). In both cases the values grow over time to reflect growing damage costs as climate change worsens. The increase in the new social cost of carbon (SCC) estimate is broadly consistent with what we’re seeing in the scientific and economic literature on the growing risks and costs of climate change, and in fact is very likely an underestimate of the true cost of our carbon emissions. The increase is also consistent with the costs of climate change that we are already experiencing, such as those associated with sea level rise and rising temperatures. Climate change is making coastal flooding, extreme heat, extreme precipitation, and other weather events worse, while we have more people and property in harm’s way. Climate change is contributing to the conditions that cause drought. Last year’s drought in America cost over $30 billion. If the calculations continue to follow the latest science and economics, we can expect them to rise as more carbon goes into the atmosphere and the Earth continues to warm. As methods to evaluate and quantify climate impacts improve, that will also raise damage costs. A warmer world is also a world with more taxpayer dollars going to disaster aid, more spending on emergency response, and higher costs for homeowners and businesses. Hopefully, we will take measures to avoid runaway increases in those social costs by making deep cuts in our carbon emissions and finding ways to help protect communities from growing climate risks. What was the process for determining and updating the SCC estimates? The process for arriving at the original SCC estimate and updating it involved a large number of agencies whose rulemakings are likely to be impacted by this calculation or who have expertise on the subject. These include the Council of Economic Advisers, Council on Environmental Quality, Department of Agriculture, Department of Commerce, Department of Energy, Department of Transportation, Environmental Protection Agency, National Economic Council, Office of Management and Budget, Office of Science and Technology Policy, and the Department of the Treasury. The interagency working group arrived at their estimates using three commonly-used integrated assessment models (IAMs), which economist refer to by their acronyms: PAGE, DICE and FUND. In general, these models use scenarios of carbon emissions and associated projections for key climate factors (such as global average temperature and precipitation changes) which drive a variety of impacts in different sectors (such as public health, agriculture, etc.) and then arrive at dollar values for the impacts per unit of carbon (CO2) based on the relevant scientific and economic literature. The models differ in their specifics and none of them are able to capture and evaluate all the major categories of impacts. There are also problems with which climate factors are incorporated, the way they are used, and whether they are appropriately downscaled at a local level. For example, timing of precipitation over the course of the year matters for agriculture, not just the average annual amount of rainfall in a given year. The global average sea level rise (8 inches since 1880) also masks significant local variation (for example, in the U.S. we have experienced local sea level rise of 10 inches to 46 inches in places along the East and Gulf coasts). Improving the way climate factors are accounted for in these models could raise the SCC by orders of magnitude. It’s also the case that IAMs don’t reflect just how devastating unchecked climate change will be. For instance, some economic analyses assume that areas of the planet will remain economically productive, even under a worst-case warming scenario. It’s hard to imagine people will want to keep doing business in an underwater city or that we’ll still have economic activity in places that are too hot and humid for people to walk outside for more than a few minutes without suffering from heat stroke. Similarly, the standard models do not capture risks of low-probability but high-impact events, so-called climate “tipping points,” such as the melting of the Greenland ice sheet or the release of vast stores of methane trapped under the melting permafrost, or radical changes in the jet stream or ocean currents that could affect major weather patterns like the monsoons. The interagency process for determining the SCC estimates to date has involved a number of experts, and at least three workshops. Yet it has not allowed for clear opportunities for public comment and input. This should be remedied. But that in no way takes away from the fact that we need a science-based estimate of the SCC, prepared in a timely fashion, for use in the cost-benefit analyses for regulations. There are a number of draft and upcoming regulations that will use the social cost of carbon in evaluating the benefits of the regulation. As agencies solicit comment on all aspects of the regulations, experts should and will certainly have the opportunity to weigh in specifically on the social cost of carbon – its use, the estimates, the methodology, and any relevant science and economics. Another additional option could be to have a transparently organized external expert review process for calculating and updating the SCC in the future, and with all comments made public (though anonymous). The expert review panel could be organized in a similar manner to the EPA’s Science Advisory Board, for example. The models used to calculate the SCC are not perfect, and economists are still trying to catch up with advances in climate science, but they are important tools that can help improve decision-making if used appropriately. Just like the Federal Reserve uses models to set interest rates and baseball managers use models to evaluate a player’s expected performance, models like these can help shed light on future scenarios so policy makers can make better decisions. While the economic models we use to examine climate change and its impacts and costs will keep being updated, it would be a mistake to throw the baby out with the bathwater. In fact, experience has shown that every time these models are improved to better reflect the latest science, the SCC estimates are shown to be higher. Other insights from economics that evaluate optimal choices in the face of catastrophic risks should also be incorporated. Global warming is a global problem. The impacts of our carbon emissions are spread around the world so it’s commonsense to use a global estimate of costs. This is consistent with regulatory statutes and has the endorsement of a large number of government agencies that were part of the interagency taskforce on the social cost of carbon, including the Office of Management and Budget and the Treasury. The U.S. is the second largest emitter of CO2 today and the largest cumulative emitter of CO2 since the Industrial Revolution. Our emissions are one of the major reasons atmospheric CO2 concentrations reached an all-time high of 400 ppm recently. We should be willing to step up and show some global leadership on cutting emissions. What’s more, we have plenty of cost-effective ways of doing that without harming our economic well-being, including by switching to cleaner forms of energy and investing in energy efficiency. Yes, our children and grandchildren’s futures matter so don’t discount them away! Warming temperatures can contribute to worsening ozone pollution, which causes respiratory illnesses and breathing problems especially among children and the elderly. There is a highly academic discussion ongoing on the right discount rate to use in calculating the social cost of carbon. Discount rates are based on the assumption that a dollar in the future is worth less than a dollar today, assuming the global economy and prosperity grow. The SCC report provides estimates discounted at 2.5 percent, 3 percent, and 5 percent. The choice of discount rate matters greatly because the impacts and costs of our carbon emissions will be borne primarily by future generations. But the concept of discounting makes the most sense when applied to individuals, not across generations. In fact, there is a growing consensus among economists that the best approach would be to use a declining discount rate to better reflect inter-generational considerations. My children will be 25 and 27 in two decades and I’d like to think that their future (and the future of all children, and all future generations, everywhere) matters. They deserve to live in a world without some of the more extreme impacts of climate change. And our generation has the obligation to step up to make sure we’re taking the actions to ensure that, i.e. cutting our carbon emissions. Today’s House hearing is sure to garner a lot of sensationalist headlines. What’s important to keep in mind is that this is ultimately about the costs of climate change which are all too real already. Our growing emissions are also burdening future generations with steep costs. The SCC is simply one important way to factor those costs into our emissions choices today. Congress should also live up to its responsibilities and put a price on carbon through legislation. But somehow I don’t think we’ll be having a House hearing on that any time soon. About the author: Rachel Cleetus is an expert on the design and economic evaluation of climate and energy policies, as well as the costs of climate change. She holds a Ph.D. in economics. The first three numbers are three estimates averaging costs from different scenarios and models, and differ, in order, by how much they discount “future costs and benefits” (5, 3, and 2.5 percent, respectively). The last number is the cost of emitting one ton of carbon dioxide under the worst five percent of all models. These different discount rates essentially reflect how much of the damage an emission today that causes damage to people in the future is actually reflected in the Social Cost of Carbon right now. If discount rates are confusing, read this excellent explanation of what they mean courtesy of David Roberts.